I wanted to get the heel done, turned, gusseted—and I did. The upper (instep) continues in the slices/stripes/streaks. 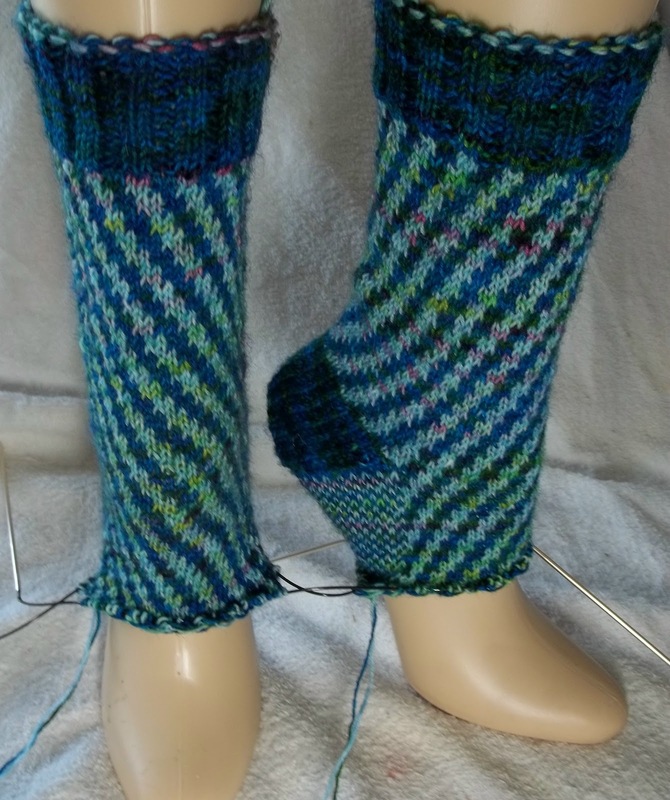 I haven't really decided what to call the stitch pattern --Or the whole sock either. May's socks doesn't quite do them justice, does it? Maybe Maypole? The sole is in a simpler pattern a basic birds eye pattern. The gusset, which is unseen, is on the sole. I love both stitch patterns but that's partly because I love the yarns. I think I'd like these yarns in a basic horizontal stripe. I'll work on the socks again to day—at home and while waiting at the doctors--my appointment is at 1 this afternoon. I don't want to bring fancy lace with me—I wouldn't be able to concentrate on it any way. If I feel up to it, I'll get back to the shawl early this evening—or at the latest, tomorrow. The sock pattern is just complex enough to be fun, but simple enough to do out while waiting—especially now that I just have to work on the stitches, and not also remember to decrease.